The first time I heard of Mara Dyer was at BEA. Everyone was going on and on and on and on about this book. So when my fellow blogger Damaris got her hands on her. I pounced on her. She knew she had to give it up because I just wouldn't have it any other way. LOL. It's definitely a good read but left me scratching my head. And I'll explain why. 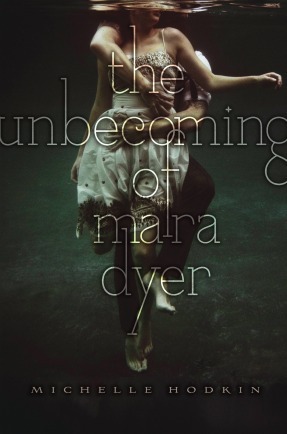 So "The unbecoming of Mara Dyer" starts off with Mara in the hospital, not knowing what happened to her or how she got there. She had no recollection of the accident that left her alive and three of the friends dead. The whole incident left her distraught and everyone around her was tipy toeing. Afraid to make matter worst, Mara's parents agreed that she can use a clean break and moved the family to Florida. But with every new teenager at a new school, you almost never fit in right away. And that was the case with Mara. She already had some girl who didn't like her for no apparent reason. However she did make friends with Jaime, a guy who basically gave her no choice but to talk to him because he just carried on. (I liked him) And like in every book or movie, you have your cocky but gorgeous guy who knows you want him before you even know it. His name is Noah. (I love Noah, LOVE Noah) Noah is the kind of guy I wish I had by my side as a teenager. He showed interest in Mara and wouldn't have it any other way but to claim her as his. He's a guy with a sense of humor that can make you smile on your darkest days. He was perfectly written. In my opinion, he's the best character in this book. Anyway, moving along. So basically after the accident and move to Florida, Mara starts suffering from Post Traumatic Stress Disorder. Many people get that after enduring some type of traumatizing or life altering event. So she started seeing and hearing things that she knew wasn't there. She just felt crazy and was worried she'll end up back in the hospital. After a few unfortunate events, she confessed to Noah about the accident. And being a guy like any other, he had to help his girlfriend. And that's where it gets confusing to me. Apparently alot of other bloggers understood what was going on but I was left like "Huh?" But luckily I wasn't the only one that felt conflicted with this section of the book. Because my fellow blogger Damaris did too. So I guess maybe when Book 2 comes out, maybe I can come to a understanding. However I still feel this is a great read. And given the chance to read an ARC of it. I'm happy. I give this book a 4 stars. Only because I was left confused. But it's a good book and a definite "Good Choice for Reading"
I can't wait to read this one I just hope I don't get confused in the end as well. Thanks for the review! I hope so too Jessilyn. But that won't stop you from enjoying that book. been wanting to read this, and reading both your reviews nudged me towards the wanting to read it a bit more, i want to know what's the confusing part!! :) the only drawback is that you need the second book!